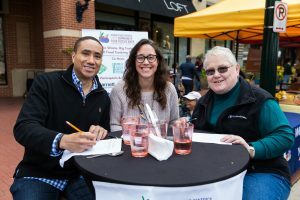 Gaithersburg, Maryland — Hundreds of people gathered today to watch two teams of professional and amateur chefs compete in No Waste, Big Taste: A Rescued Food Cooking Competition. 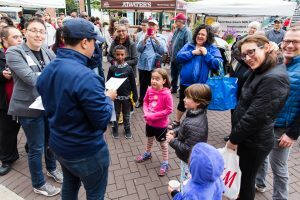 The competition, organized by Manna Food Center (Manna) and co-hosted by Downtown Silver Spring and FRESHFARM Market, was the final event of Montgomery County’s first-ever Community Food Rescue Week. NBC4 news anchor Cory Smith emceed the event. 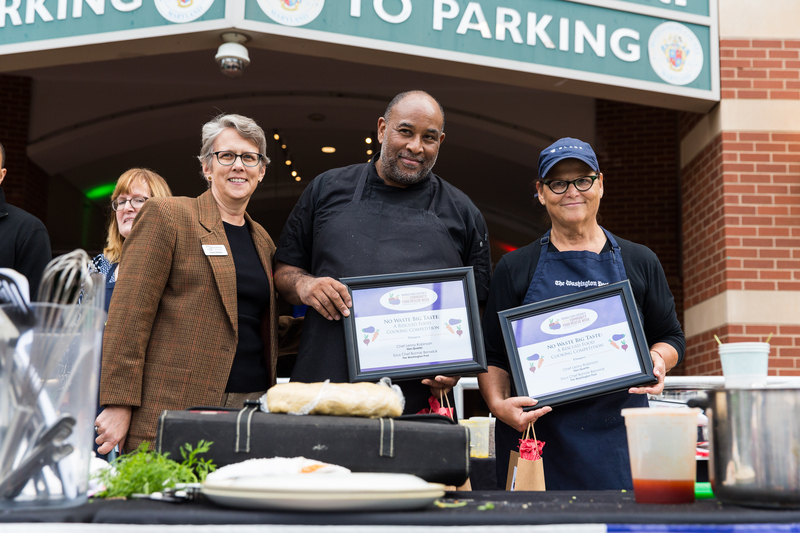 Hen Quarter’s head chef Lenny Robinson and sous chef Bonnie Benwick, deputy food editor of The Washington Post, were named winners of the competition. 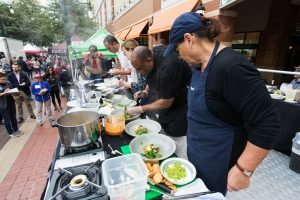 Marriott Wardman Park head chef Jalal Bellekat of Marriott Wardman Park and sous chef Caroline Taylor, executive director of Montgomery Countryside Alliance came in a close second. Each team was tasked with creating two courses using mystery ingredients and ‘ugly’ produce including Brussels spout leaves, sweet potatoes, and apples that were unsellable or surplus and if not ‘rescued’ could have ended up in the landfill. More than 63,000 Montgomery County residents struggle with food insecurity, but Manna’s innovative Community Food Rescue app is making it easier than ever for local businesses to help direct their surplus food to community members experiencing hunger. To date, the Community Food Rescue network of food businesses, volunteer food runners and hunger relief organizations has rescued and redistributed over four million pounds of food – the equivalent of 3.3 million meals. “We hope the week’s events will inspire deeper involvement from our community. Manna is incredibly thankful for the generosity of our sponsors, businesses, organizations, and volunteers that have made Community Food Rescue Week possible,” DeCarlo added. Judges for the competition – Maryland State Senator William C. Smith, Jr. (District 20), Montgomery Coalition for the Homeless Community engagement specialist Lynn Rose, and Shepherd’s Table executive director Jacki Coyle – evaluated each course based on taste, presentation, and minimal food waste generated. While the winning two-course meal – an appetizer of warm roasted butternut squash salad with kale, Brussels sprouts, apples and peanut vinaigrette and a main dish of chicken and dumplings with kale, black bean and corn rouille – won over the judges, both teams inspired onlookers with their creativity. Throughout Community Food Rescue Week, members of the community had a chance to cook with rescued food, test their food knowledge during a night of trivia, glean apples from a local orchard, learn how to compost food scraps, and much more. Manna organized Community Food Rescue Week to inspire action and spotlight ways the community can come together to tackle food waste and hunger. Manna also encouraged more food businesses and nonprofit food provider organizations to join its Community Food Rescue network and visit the website to learn more and sign up. ABOUT MANNA FOOD CENTER: Manna Food Center is the designated food bank for Montgomery County, MD. For 35 years Manna has provided supplemental food assistance to food insecure residents in Montgomery County. Manna supports more than 3500 families each month through its three main food distribution programs Food for Families, Smart Sacks, and Community Food Rescue. Additionally, Manna’s Farm to Food Bank and Nutrition Education programs give participants access to fresh produce and the knowledge needed to make healthy decisions for themselves and their families. Visit www.mannafood.org for more information. ABOUT COMMUNITY FOOD RESCUE: The Community Food Rescue network, a program of Manna Food Center, is the coordinated food recovery network of Montgomery County, Maryland. This program utilizes innovative matching software to enhance the good work of businesses, individuals, and organizations that recover and redistribute perfectly good food to people experiencing hunger. Our goal is to mobilize the entire Montgomery County community for collective impact in tackling food insecurity and food waste. Visit www.communityfoodrescue.org for more information.